Looking for Adult Day Care services in South East Minnesota? Search our records in Fillmore, Goodhue, Houston, Mower, Rice, Steele and Winona counties for an Adult Day Care Center near you. What are Adult Day Care Centers? Who is eligible to use Adult Day Care? The Minnesota Department of Human Services states that most Adult Day Care centers generally require a person to need support due to disability or age and have a functional impairment which affects their ability in the activities of daily life. The impairment can be physical or mental or both, and you must contact the Adult Day Care Center of your choice for specific eligibility requirements. Since eligibility, cost and other factors can be different from center to center, you must contact the center of your choice BEFOREe making any decisions. The information on this web age could change at any time. 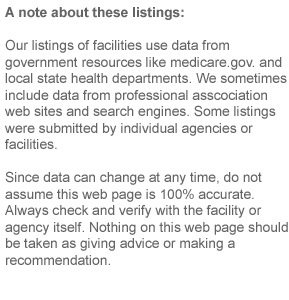 Be careful to always verify by contacting the individual facility. What Does Home Health Care Cost in Minnesota?